I know this is just simple knitting, but oh how I love simple knitting that comes out looking and feeling this beautiful! 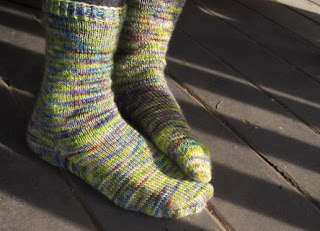 Have you noticed that acres of knit stitch don't always look so fabulous? You might have a variation in tension that shows, or accidentally twist a stitch, or the yarn just might not sit perfectly every time. This mohair/Romney blend from Stoddart Family Farm forgives everything and OH BOY is it warm. 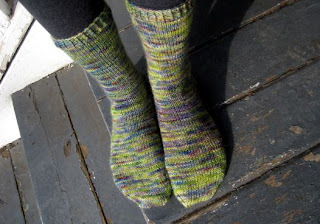 And amazingly soft on your feet - you wouldn't think it, but it is. I love the yarn regardless but Silvia explains that the reason you still find a bit of vegetable matter in it is that she's elected not to put it through the harsh treatment needed to erase those last bits of harvest. Do you mind pulling out vegetable matter? Some people do, I know - but I don't when I know the yarn has come to me just a short distance, in processing terms, from the animal it grew on. In fact I welcome those reminders that I'm doing something emphatically low-tech. 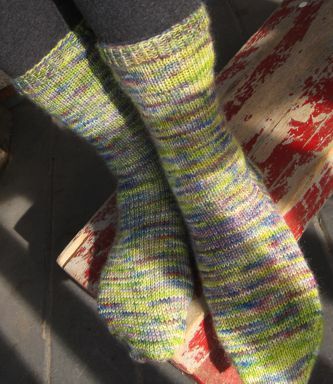 I think this will be my last pair of Stoddart socks this season - the weather is starting to turn and warm already, and I'd feel more like I'm racing to catch up than wisely knitting ahead - but I'm hopeful about getting started soon on a pair of twined mitts with the same yarn. Can you imagine how delicious those would be? Lace: is it really for me?